Using Xpages, you can do many neat things in Notes. But I am still doing all my development in classic Notes, despite being on Notes/Domino 8.5.2. The reason is simple. Memory. There is just not enough memory to run the standard client in our Citrix environment, so all users are using the basic client. And Xpages is not working in the basic client. So how do I solve issues like multiple documents tied to a main document, being displayed inline in the main document? Well, I solved this a long time ago by using a rich text field and building the document list on the fly. I am sure many other Notes developers use this technique. I know it was discussed in a session at Lotusphere several years ago, perhaps as long ago as 7-8 years ago. So this is of course not anything I came up with myself. In this post I just want to share how I am using this, and perhaps this can help someone. The database (download it here) is very simple. It contains three (3) forms and two (2) views. In addition I have some icon as image resources, but that is just to make things pretty. The QueryOpen event, which executes before the form is opened in the front-end and displayed to the user, contains some Lotusscript code. 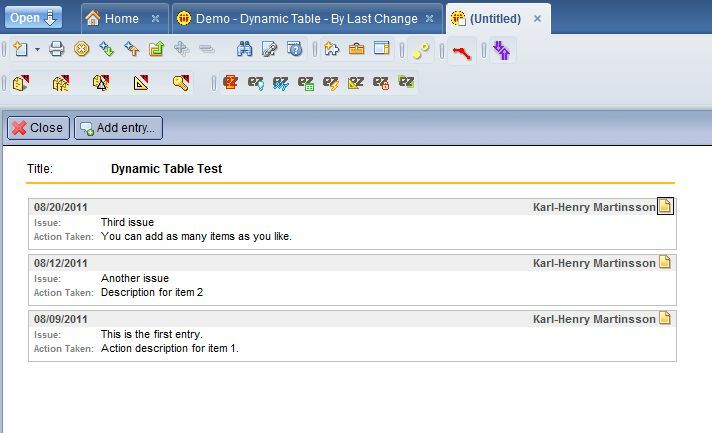 This event let us modify the document in the backend, which is where rich text fields can be updated. The code – which I will post at the end of this article – is very simple, it is just over 50 lines of code. 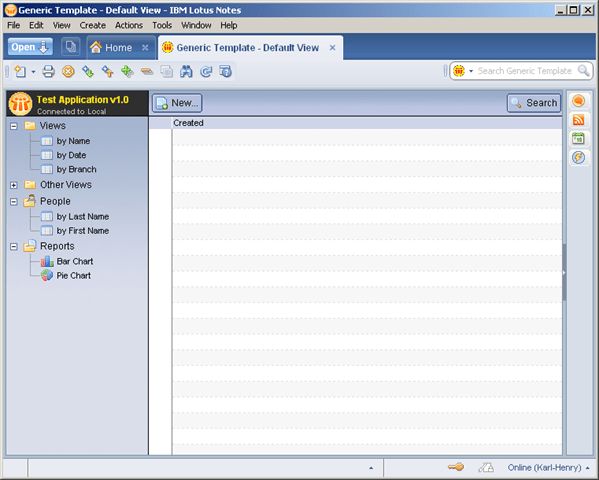 ‘ItemDate’, ‘Issue’ and ‘Action’ – user data fields. The code simply store the calling document (MainDoc) in a global variable when being opened/created, and then force a save and reopen of it when closing. This will trigger the QueryOpen event in the MainDoc document to rebuild the rich text content. The action button ‘Delete’ contains some code to flag the current document for later deletion. I normally do not allow users to delete document in production databases, instead I use a field to indicate that the document should be ignored in views and lookups. Later I run a scheduled agent to actually delete the flagged documents. Finally the code that makes it all happen. The code simply perform a lookup in the view (LookupEntry) to get all entries associated with the current document and updates a few fields (mainly for view display purposes). The code then loop through the entries and for each entry creates a template document and render it into the rich text field. That is basically it.
' *** Copy Rich text Field "Issue"
' *** Copy Rich text Field "Action"
It is of course easy to change the sort order, field to use for sorting, etc. Update: 2011-08-17 – Fixed download link. Many of my Notes application have a similar/the same look, based on a generic application template I created a while back. The standard look makes the users feel at home when I deploy a new application, and the template makes life easier for me. If I create a new application based on that template, I already have the frameset, navigator and a few design element done before I even start the development. I want to share the template with the Lotus community, as a small way of giving back. I may add more things to it later, I will post any modifications here as well. Update: Download link fixed now.Thanks Hynek for pointing it out! At my work, we had several issues/needs related to agents in different Domino databases. I tried to come up with a quick and lean solution, that gave us the functionality we needed, nothing more and nothing less. Yes, I am aware of Julian Robichaux’s excellent OpenLog. But we had some needs that I did not feel were addressed in that project. What I wanted was a database where the agents could be documented, and also where the log data was stored. So I created a Agent Log database where one document is stored per agent. The form let me document the actions of the agent, as well as what server it is running on, in what database, when it is triggered, etc. When the document is opened, I also read the last time the agent was run and if the agent is enabled or not. This is what the actual database looks like. I plan to release the database on OpenNTF.org when I get the time. 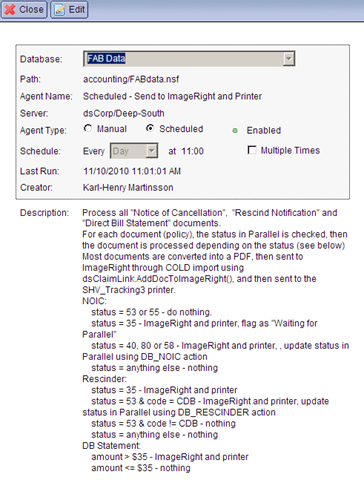 Print "AgentLog: Failed to locate agent document for " & agentname & "." All code goes in the (Declarations) section of the script library. There are a few things to notice. I actually make each log item a child (response) document to the main document. 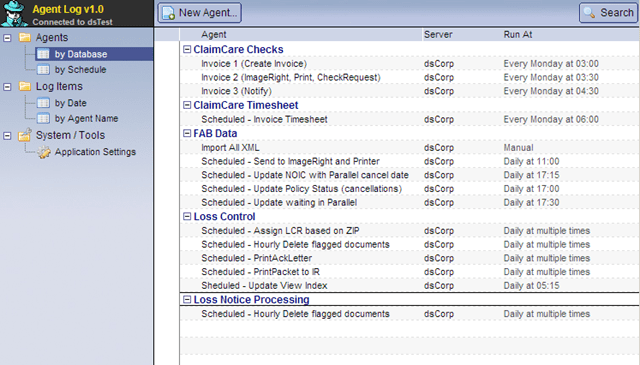 By doing this, I can easily later create reports for each agent about all the times it was executed, etc. When the object is instantiated, a blank string is normally passed. This will set the agent name variable to the actual agent name. The agent name is listed in the agent log document. If for some reason you want to use a different agent name in the document (e.g. the agent is a manually triggered agent called AdminUpdateSelectedDocuments and you want it listed just as UpdateSelectedDocuments). In the Initialize event, I put one line at the beginning and one right at the end. The first line instantiate the agent log object and. set a flag indicating that the agent is running. The second line will clear that flag, so the final function knows that the agent ended gracefully. The last thing is to add one line to the Terminate event. This line is where the logging is actually done. If the flag running is set, we know the agent was terminated before it actually reached the end. Kathy Brown today asked “What’s Your Favorite Tool“, so I thought I wanted to share the tools I use. My favorite tool is probably NoteMan from MartinScott. If I have to pick one tool from the suite, it would be either NoteMan.Editor or NoteMan.DocDelta. It is very hard to decide between the two of them. Editor is great for editing documents, see the contents of different fields and even change data types. I use it to get the UniversalID of documents and much more. DocDelta help me solve replication conflicts quickly and easy. I can higly recommend the NoteMan suite of tools to any Notes/Docmino developer, and for the price ($395 for the whole suite), you get a lot of functionality. I also use several tools from TeamStudio and Ytria. Yes, I am lucky enough to have a boss who believe in getting me the tools I need. From TeamStudio I use Undo (previously called Snapper) to make snapshots of the design while developing for easy roll-back, Profiler to find performance issues in my code and Configurator for search-and-replace through-out a database (design and/or documents). Those tools run around $500 each, if I recall correctly. I also use their free class browser, a tool I highly recommend to everyone doing object oriented Lotusscript development. From Ytria I use a number of tools.The two I use the most are scanEZ and actionBarEZ. The latter is great when I want to apply a specific design of action bars to many forms and/or views. I design the action bar in one view, with colors, fonts, backgrounds, etc. When I am satisfied I can update all views and forms the the database with the new design. I don’t use scanEZ as much, but still on a regular basis. It also have functions to identify replication conflicts, like NoteMan.DocDelta, but the two tools complement each other. Using scanEZ, I can locate and delete documents of a particular type, including profile documents, and much more. I also sometimes use designPropEZ to check the design of a database and make sure it does not inherit element from the wrong templates/databases.